I ope it will be helpful. A lot of thanks eslprintables! 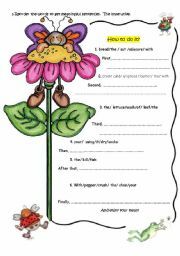 This worksheet is a test for the 8th formers. 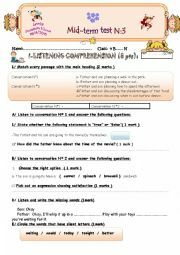 It contains reading comprehension questions, language exercises and a writing task. I hope it�s useful. HAPPY NEW YEAR FOR ALL OF YOU. 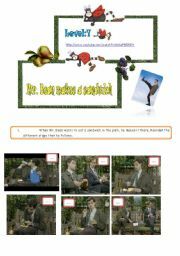 Students watch a video about making a sandwich acted by the funny �Mr. Bean�. Then they answer some questions:reorder pictures,complete the recipe of Mr. Bean,reorder words to get meaningful sentences using the imperative.Sorry to divide the worksheet into 2 parts! I�ve tried to compress the pictures but I didn�t succeed!! Hope you�ll like it! This lesson contains 5 pages. It�s about techin poetry in the classroom. The first page is the whole poem. The second and third are comprehension questions. The fourth page is An analysis of the imagery in the poem "The Daffodils" by Aubrey Weese. 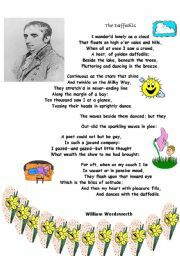 The last page is a writing task: writing a poem imitating a model. I hope you will like it! Blood donation is a lesson to be done with level 1 students. I have changed some tasks to be simpler and more motivating! I hope that I�ve succeeded! This is part 2. Enjoy! 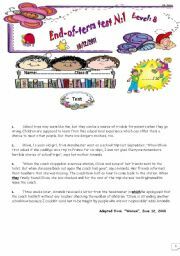 This worksheet is about some of the most common mistakes that my kids did in a writing test. I typed their sentences/phrases and we corrected them in the class together. 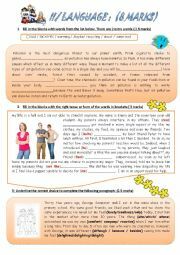 I think it�s a fruitful strategy to make the students recognize their mistakes and don�t repeat them again.